Trauma has become a significant health problem, in part due to high velocity transportation and the use of penetrating weapons, especially firearms. Not only the young, but also the elderly and pregnant women are affected. Improvements for those affected include more rapid rescue, better organization of trauma centers, and advances in treatment. There are three recent trends: the increased tendency for non-operative care, the resulting increased need for accurate non-invasive imaging diagnosis, and a desire for cost-effective use of imaging. One aspect of the trend towards non-operative care is the desire to avoid non-therapeutic surgery; this is possible if imaging can identify those patients who require surgery. Another aspect is the realization that non-operative care can result in better long-term outcome, such as salvaging splenic and renal function. Lastly, imaging evaluation with a high negative predictive value may allow for discharge of trauma victims directly from the Emergency Department, avoiding hospital admission for observation. Controversy exists about the appropriate use of CT versus ultrasound (US). Each has advantages and disadvantages [1-3]. In general, CT has been shown to have the best statistical accuracy for detecting, characterizing and excluding injuries. If the volume of trauma justifies it, CT can be located in the trauma suite such that even unstable patients can be examined quickly and without compromise. This has been done in our institution and there is heavy reliance on CT for rapid accurate diagnosis, avoiding diagnostic peritoneal lavage and non-therapeutic laparotomies. CT is more reliable at excluding injury in those who may be discharged home, avoiding observation in hospital. However CT may be overused - in one study only three of 100 patients had an alteration in clinical management after follow-up CT . Sonography can detect significant injuries that can be treated; conversely, low risk patients with normal sonograms may be observed and possibly avoid CT [2, 3]. One of the strengths of US is its ability to detect peritoneal fluid, a significant but nonspecific finding indicative of abdominal injury. However, abnormal US often requires further evaluation by CT. In a large study, US had 86% sensitivity and 98% specificity, with 43 false negative and 23 indeterminate studies, including six splenic, one liver, one renal, one pancreatic and one bowel injury . 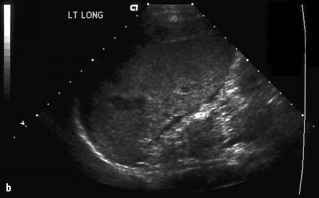 Although the incidence of significant injury in the absence of free intraperitoneal fluid is low, it does occur. A multi-institutional study found a 28% incidence of splenic and hepatic injury in patients with no or minimal free fluid on Ct . In patients with seat belt marks, where bowel and mesenteric injury are common, US has been reported to miss up to 78% of significant injuries . 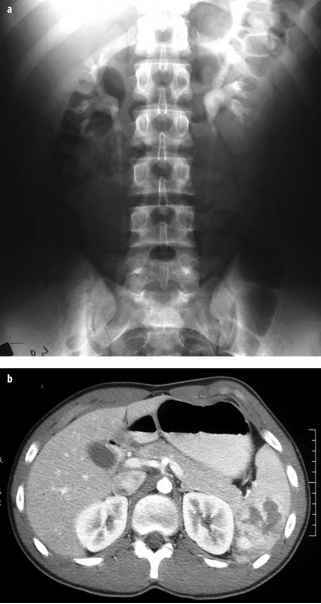 The advent of multidetector CT (MDCT) for trauma has allowed some improvements, although routine trauma CT of the abdomen has changed little. Use of MDCT allows for more rapid acquisition of high quality images of multiple body parts, such as examination of the head, neck, chest, abdomen and pelvis. It allows for better reformatting of images, with either thinner slice reconstructions, or other planes. In addition, if clinical circumstances warrant, a CT angiogram can be performed immediately followed by routine trauma imaging. In traumatized pregnant women, US should be the first examination. It can evaluate the pregnancy, documenting fetal viability. US is nearly as accurate in detecting abnormal fluid in pregnant, as in non-pregnant patients . If US shows fluid or other injury, CT is justified to obtain the best evaluation (Fig. 1). The best outcome for the fetus is assured by the best care of the mother. The radiation risk is reasonable if there is life-threatening injury, necessitating prompt diagnosis and treatment . 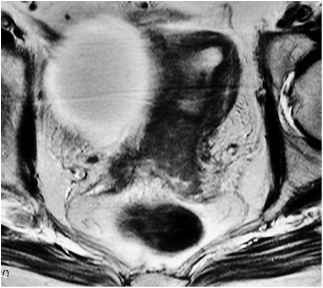 ue in trauma in general, it has severe limitations in detecting genitourinary (GU) injury. Free intraperitoneal fluid may not result from renal injury; although it may from bladder rupture, US cannot diagnose bladder injury. In a study of 4,320 trauma patients who had undergone US, 33 of 99 patients with urologic injury had false negative US. The sensitivity was only 56% for those with isolated urologic injury . US is also not capable of grading renal injuries. CT has excellent negative predictive value for renal injury. Presence and type of renal injury can be accurately indicated . Renal contusion demonstrates ill-defined a c regions of diminished enhancement. Segmental renal infarction is identified as a wedge shaped, well-defined area of non-enhancement, and renal artery occlusion can be accurately diagnosed by its complete lack of enhancement or excretion by the kidney, usually with little to no associated hematoma. Angiography is thus not needed, and conservative therapy is now most often used. Most renal injuries are lacerations, with simple laceration limited to the cortex, and deep laceration extending into the collecting system, which may show extravasation. Scans delayed between 2 and 10 minutes aid in demonstrating or excluding extravasation (Fig. 3), although in most cases small amounts of extravasation will resolve with conservative therapy. Subcapsular hematoma is delimited by the renal cortex and may deform the renal surface; perinephric hematoma extends from the renal surface to fill Gerota's space, but does not deform renal contours, although it may displace the kidney. CT is excellent at demonstrating the extent of hematoma, and evaluating enlargement on follow-up scans . Renal fracture indicates a single complete fracture plane, often extending through the collecting system; multiple planes of disruption are seen with shattered kidney. CT can also diagnose ureteropelvic junction (UPJ) avulsion or ureteral injury, demonstrating lack of opacification of the ureter, retroperitoneal water attenuation collections adjacent to pelvis or ureter, and possibly extravasation of contrast on delay scans . Although the American Association for Surgery of Trauma (AAST) Organ Injury Severity Scale for the kidney includes lesions with a different appearance in each category (1: contusion, small subcapsular hematoma, 2: < 1 cm laceration without extravasation, 3: > 1 cm laceration without extravasation, 4: deep laceration with extravasation or main renal artery or vein injury, 5: shattered kidney or UPJ avulsion), it has been shown to correlate with need for surgery and outcome .